Life Love Food: MY FAVORITE BREAKFAST!!!! By now you have probably realized my intense love for breakfast food, and in all seriousness this is my favorite breakfast of all time! 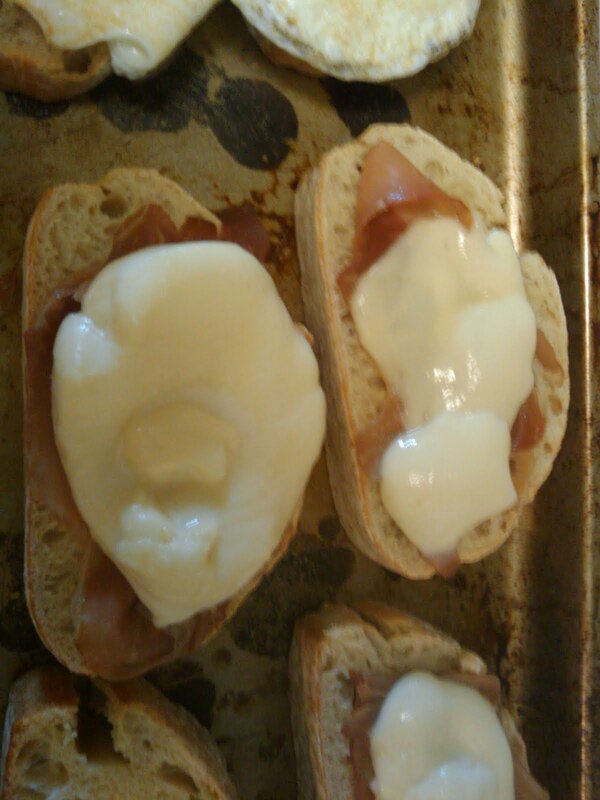 It is easy to make for one, two, twelve, however many, and it incorporates so many of my favorite foods: prosciutto, fresh mozzarella, runny eggs, and bread! I usually eat two of these little open faced sandwiches (especially after a long night) and then don’t eat again until dinner time. The recipe below is for four sandwiches (two people), so you can get the idea but it is so easy to multiply it for more. Preheat oven to 400 degrees. Put butter in a small pot over medium high heat, once melted and bubbly add sage leaves, turning once fry for about 4 minutes total. Remove leaves, with a slotted spoon, onto a paper towel lined plate to crisp. Remove butter from heat and set aside. Arrange bread slices on a cookie sheet and top each slice with a piece of prosciutto (or two), pop sheet into oven for about 4-5 minutes, allowing bread to toast and ham to get a little crispy. Remove from oven place cheese on top of the ham and put back in oven for about 3-4 minutes allowing the cheese to just melt. While the bread, ham and cheese slices are in the oven fry the eggs over medium heat to your liking, about 3 minutes if you like them runny and 5-7 if you like them hard. Place fried eggs on top of cheese then garnish with 2 sage leaves and spoon a tablespoon of the butter over the entire thing. You can barely see the yellow of the butter on the plate, but I am telling you it makes a huge difference! 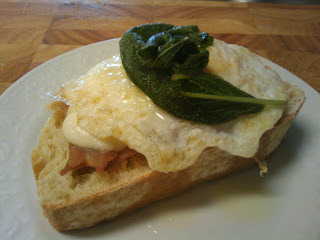 The butter along with the runny egg yolk, crispy ham, and creamy mozzarella is to die for! The crispy sage leaves not only look pretty but taste incredible!